Blue Collar Products is proud to offer our new line of fire pits built right here in San Antonio Texas. Our fire pits are welded with attention to detail and made to last. We have the ability to personalize any one of our fire pits to our customers specifications. We take pride in building a great product for a reasonable exchange of your hard earned money. Our fire pits make great additions to any backyard; whether you're located Downtown Austin, the Texas Hill Country or along the Coastal Plains. All Blue Collar Fire Pits are now coated with an industrial grade coating that delivers a smooth, uniform appearance and provides excellent corrosion protection coupled with outstanding weatherability. Special pigments are utilized to achieve maximum heat resistant properties and color stability. Unlike most of our competitors, we went the extra mile to locate a coating that will provide the ultimate protection for your investment. New for 2019 Our complete line of fire pits will now be available in either 1/8” or 3/16” steel with available options. Our Standard 48" Fire Pit starts at $380 and has the following options available. Our Standard 36" Fire Pit starts at $280 and has the following options available. Our Deluxe 48" Fire Pit comes standard with a full removable cooking grate, a shelf that doubles as a boot rest, paint and a clean out tray. You also have the option to customize this pit for an additional cost. This pit can also be built from 3/16” steel but the cleanout tray is NOT available with this option. Our Deluxe 36" Fire Pit comes standard with a full removable cooking grate, a shelf that doubles as a boot rest, paint and a clean out tray. You also have the option to customize this pit for an additional cost. We also offer a 4 Post Pit which comes standard in 3/16th steel. The simplicity of the design makes for an easy fit in any backyard environment. This pit measures 30" x 30" and stands approximately 18" tall and comes with the following available options. Would you like to have a fire pit at certain times but not have it around at others? Or, would you like to have a pit that could easily go with you anywhere; from the beach to the hunting camp? Then, our new Knockdown Fire Pits are just what you need! This fire pit is fully collapsible and portable. It comes in 5 manageable pieces and when put together it measures 30"x30"x12". 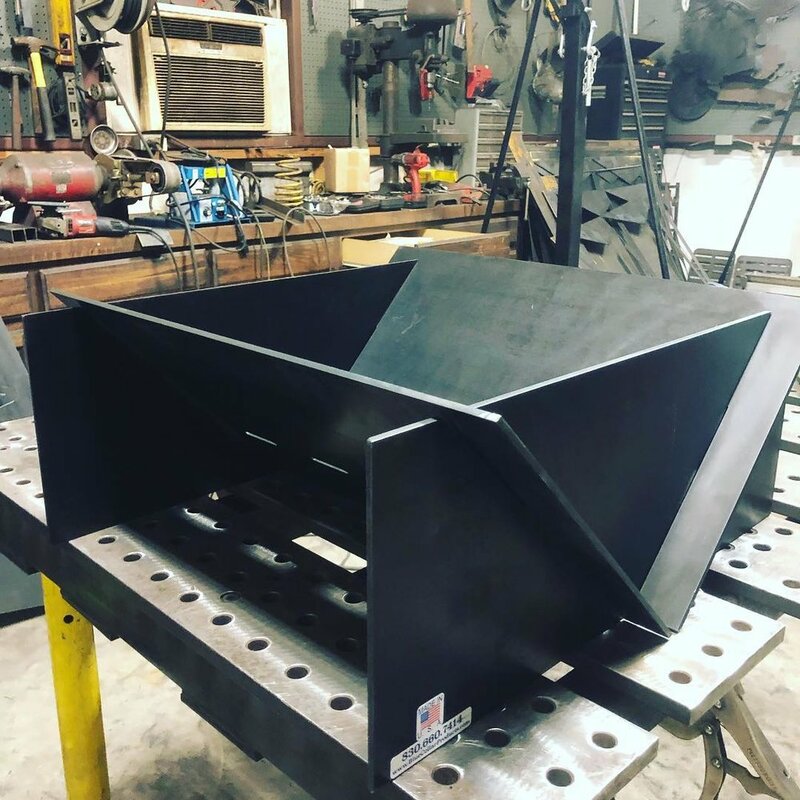 This pit is built out of 3/16" steel and will last a lifetime no matter if you choose to leave it setup in the elements or decide to store it during the off months. If you've previously purchased one of our Standard 48” or 36" Fire Pits and would like the change the whole dynamic of your pit then these full removable grates are just what you need. Both the 36” and 48" are made from 3/4" #9 expanded metal with 1" angle. Coiled handles will come standard on all grates. These small cooking grates are available for both the 36” and 48” Standard Pits. Check back regularly to see our newest pit builds that will be added to our Fire Pit Product Line. **Also, if you have an idea of a custom fire pit that you have your mind set on, give us a call, we'd love to help turn your vision into a reality!